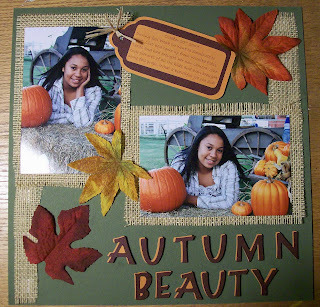 Okieladybug's Scrap N' More: This was the layout that got me hooked! I did this layout just about a week after getting my Cricut. I joined the Cricut messageboard on Christmas Day 2007 when I registered my baby bug and that is when I saw the messageboard. I was so hooked *okie is glad she isn't hooked anymore...but then wonders about facebook and decides she should have some addictions to something that isn't illegal or unhealthy* and I couldn't stop reading and skimming through the whole board! I was so upset when school started back after the holidays and I had to get up earlier and couldn't stay up late at night reading and posting! Oh yeah back to the layout. I am not sure what it was about this layout since the only thing Cricut was the title and the tag, but it was the one that sent me into the deep depths of the Cricut world. Oh yes I know why this one will always be special to me, besides the awesome beauty of my daughter in the pictures...it caused me to be friends with my beloved Softbrn! It was after she commented on this layout that we started talking regularly and sending pm's. That turned into emails and the phone calls. I don't get to talk to Soft very often these days *okie thinks Soft might have her number blocked* but she is still a very dear friend to me. And like so many others, I met her on the Cricut messageboard and without that fantastic little machine I would never even know she existed! 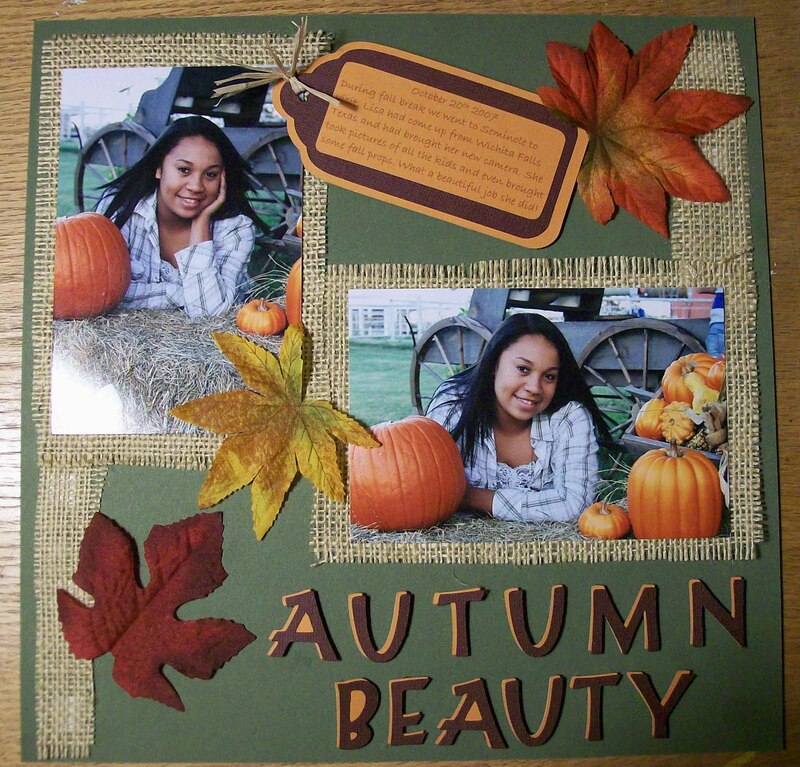 I like the leaves and burlap you used on this page. A perfect choice. Your daughter is beautiful. Fall is my favorite time of year so I love the colors. I am always drawn to these kinds of colors. TFS. If I were going to pick out something on this LO that would cause it to be your fav, it might be the colors, your awesome use of burlap, the placement of all your elements, which is is perfect ... but I think, most of all it would have to be those insanely gorgeous pics of your daughter ... you sure got the title right ... she is definitely an "AUTUMN BEAUTY"!!! But I can also understand the connection this LO brought to you and your special friend, Soft. I have been blessed with so many wonderful friends on the Cricut MB, and they keep me returning again, and again, and again. I was gonna write something silly until I saw the entry that mentioned me.. Lady!!. How could you ever think I would have you blocked???. I'm still here.. I've tried calling you a few times, but no answer.. I guess you still don't know how to work your answering machine?,LMAO!!.. Will call sometime today... Love you too!! Oh this is sweet. I love the font. Okie, I really love this layout. I can see why it "hooked" you. And you DO have a beautiful daughter!